Start your goat driving project without the expense of full harness. This training rig can never be used as a harness, but does give both you and your goat the opportunity to spend a minimum amount of time on harnessing and maximum amount of time on driving training. 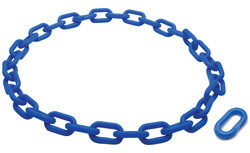 Extra Links for the Regular Plastic Chain Collars. You’ll wonder how you ever got along without this handy, fully adjustable, easy on and off rope halters. Constructed from braided rope, they’re a must have in the barn. With two sizes available, there’s a bell for everyone in the herd. The perfect way to keep track of your goats while enjoying the tranquil melody of the bells. These quality metal one-piece tapered bells are constructed of copper finished steel. Available in two sizes;1-3/4” high, 1-1/2” X 2” bottom opening and 1” high, 1” X 1-1/4” bottom opening. The small one is perfect for kids and minis, too! Plated ring fasteners feature open edge design for easy application. 1-1/4" size makes them perfect for collar attachment of ID tags and bells, too.